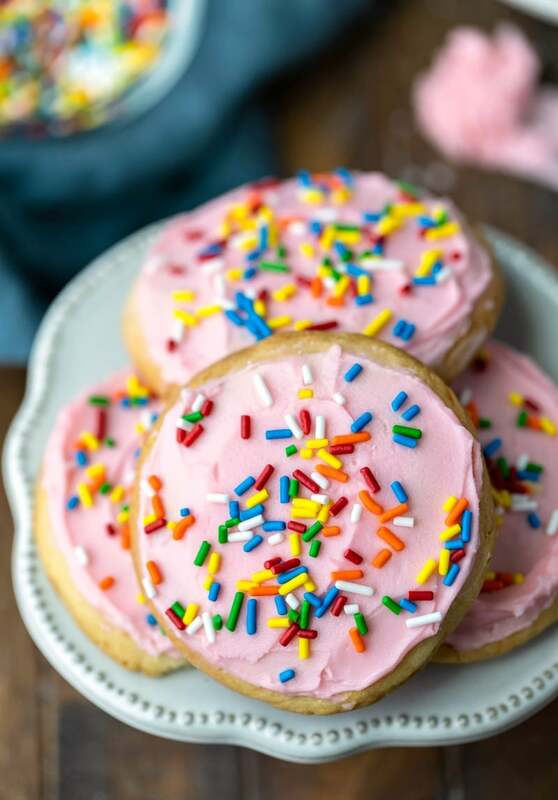 Like most kids, my kids love cookies that have frosting and sprinkles. 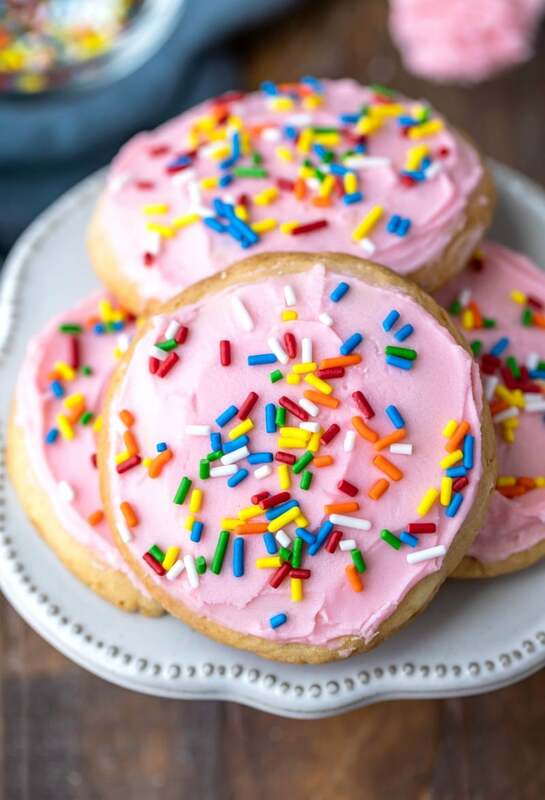 With the pink frosting and rainbow sprinkles, the Lofthouse sugar cookies are just what they like. I have to admit, I’m not the biggest fan of the cookies, and I find them a little bland and overly sweet. 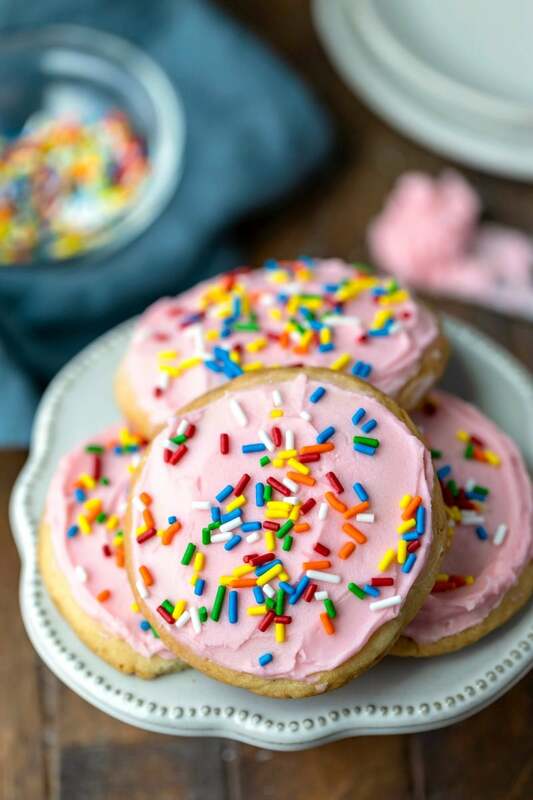 This Lofthouse cookie copycat recipe is a tastier version of the original. 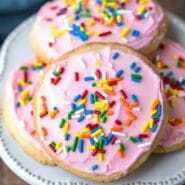 With the generous amount of vanilla, the cookies have more flavor, and my whole family prefers this version to the originals. To make the cookies, beat the cool butter, sugar, baking soda, and salt together for 30 seconds. Increase the speed to medium and beat for 5 minutes. Add the egg whites, cream, and vanilla. Mix them in until they’re combined. The dough may look like it has separated. Add the cake flour, and stir in just until combined. Don’t overmix. Overmixing will lead to tough cookies. 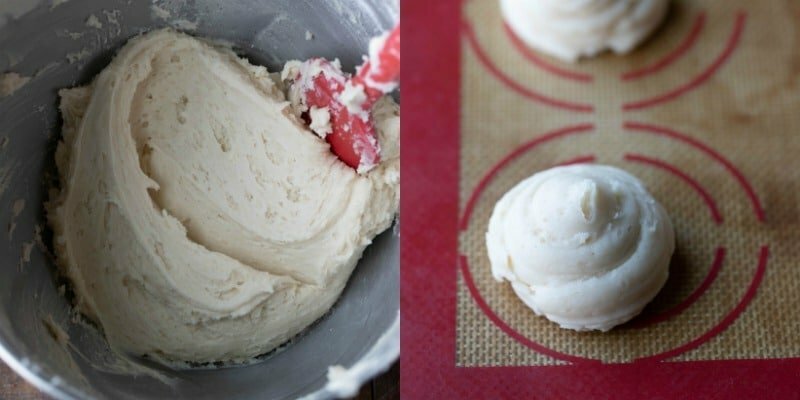 Transfer the dough to a piping bag fitted with a round 1/2 inch tip. Pipe out 1-1/4 ounce portions of dough, spacing them 3 inches apart on the prepared baking sheet. Bake until pale and puffed but not browned. To make the frosting, add the powdered sugar, salt, cream, and vanilla to a large mixing bowl. Beat on low just until the ingredients are combined. Increase speed to medium, and continue beating for 3 minutes. What does “cool” butter mean? The butter shouldn’t be straight-from-the-fridge cold. It also shouldn’t be warm at all. It should give slightly if pressed, but it shouldn’t dent easily. The butter should be about 60F. Can I just use a cookie scoop? I tried using a large cookie scoop, but the results weren’t as good. The cookies baked out more. They also had flatter, crispier edges that browned more than the cookies with the piped dough. 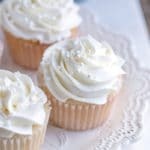 Can I tint the frosting? 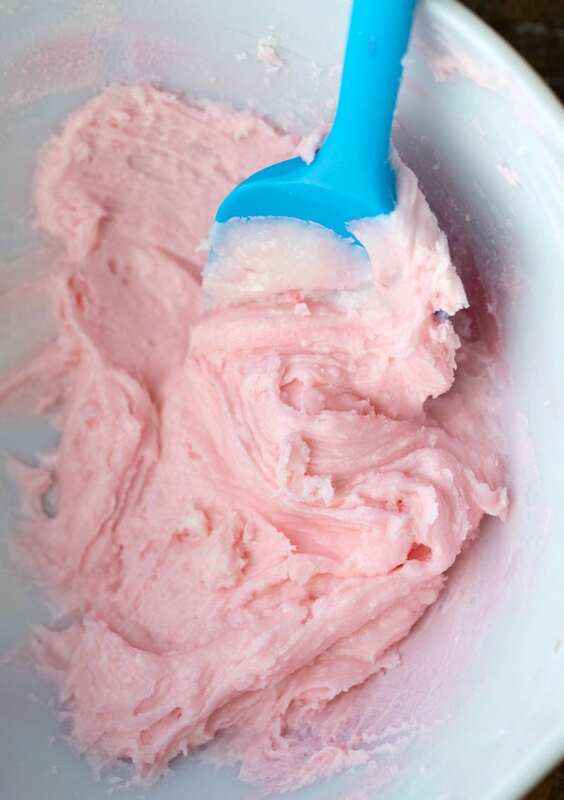 I used about a drop of red food coloring to get the pink frosting pictured here. The cookies are delicate, so be careful when frosting the cookies. 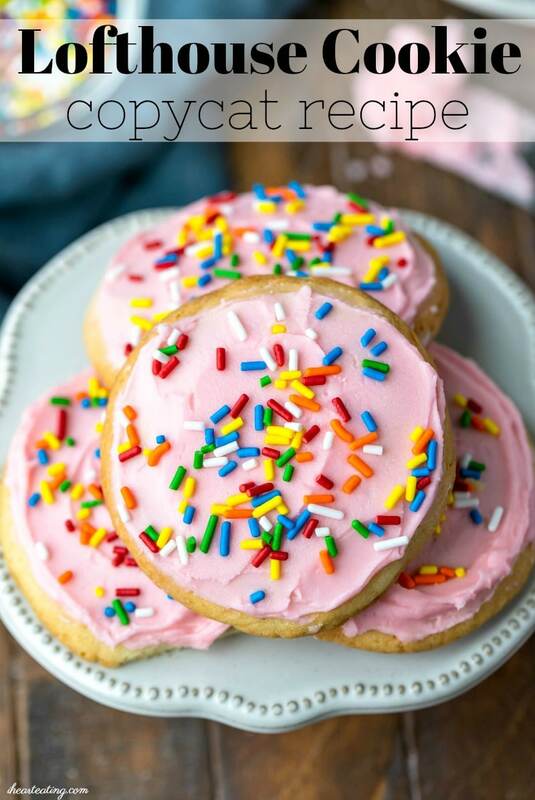 Make sure that the cookies have cooled completely before frosting them. The frosting will crust. 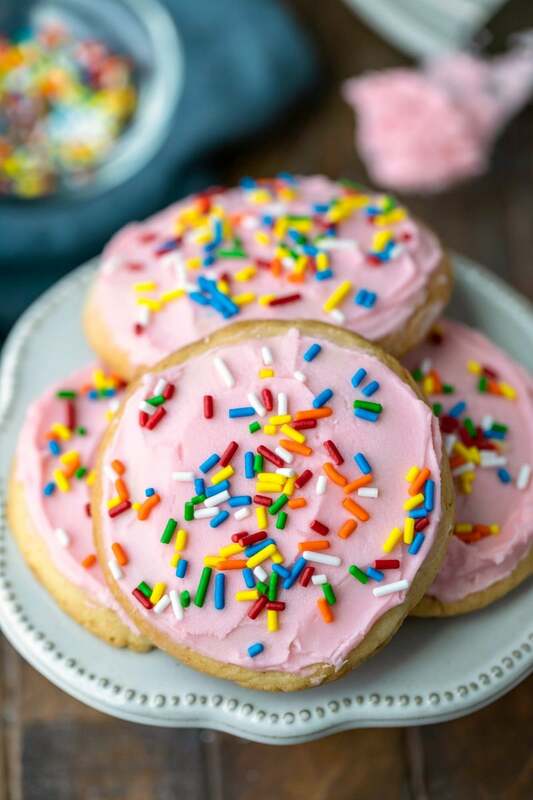 If you want to add sprinkles, do so immediately after frosting the cookies. I’ve found that the cookies keep best when stored in a resealable bag or container in the fridge. 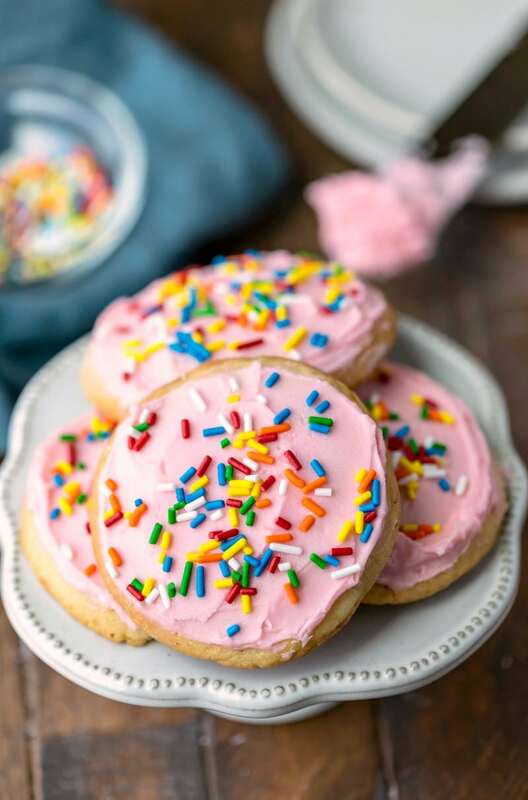 If you’ve tried this Lofthouse cookie copycat recipe, don’t forget to rate the recipe and leave me a comment below. I love to hear from people who’ve made my recipes! To make the frosting, combine, powdered sugar, salt, cream, and vanilla in a bowl. Beat on low to until just combined. Increase to medium and beat until smooth, about 3 minutes. Preheat oven to 350 F. Line 2 baking sheets with parchment or silicone baking mats. 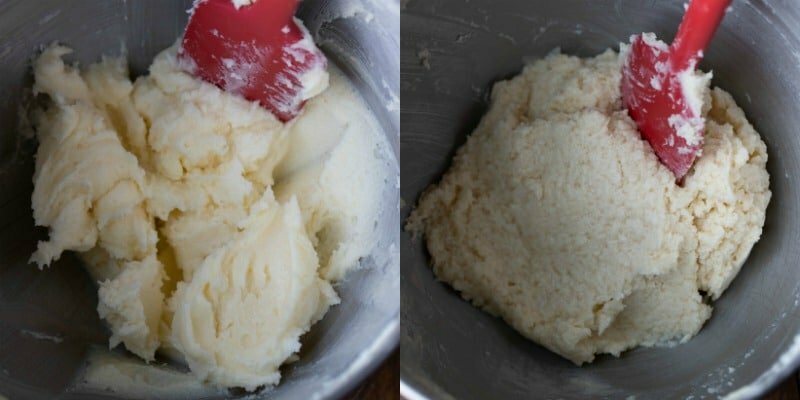 Beat butter, sugar, baking soda, and salt on low 30 seconds. Increase to medium and beat for 5 more minutes. Add egg whites, cream, and vanilla, and mix until combined. Add cake flour, and stir in just until incorporated. Transfer dough to a piping bag fitted with a plain (round) 1/2 inch tip. Pipe out 1-1/4 oz portions (about 3 tablespoons) onto prepared baking sheets, leaving 3 inches in between. 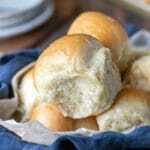 Bake about 12-15 minutes, or until pale and puffed. 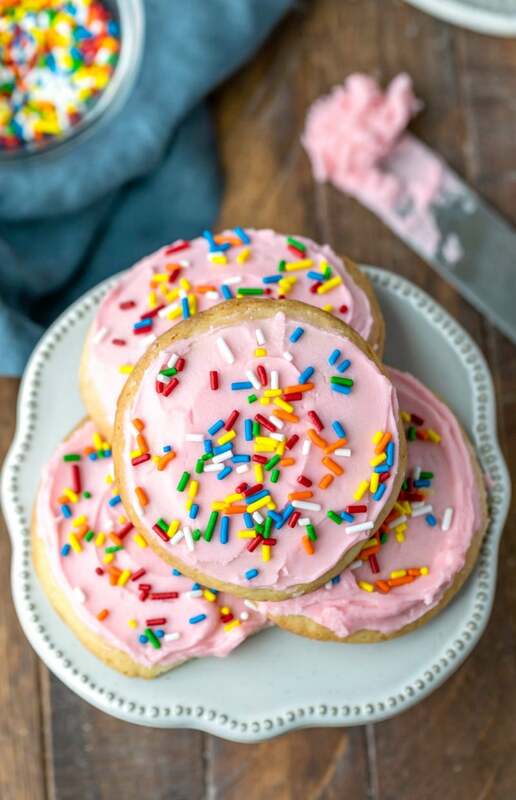 Spread frosting over cooled cookies. Store leftover cookies in the fridge. The butter should be in between straight-from-the-fridge and room temperature, about 60F. Or 1/2 teaspoon table salt. 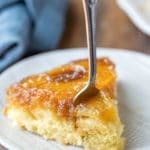 If you'd like them to taste more like the originals, reduce vanilla to 1 teaspoon. Thanks!! I’m so glad you liked them. Thanks for commenting!